We use small things to make a difference here. The big dog has a growl so low it rumbles along and feels like it is changing the earth. His growl makes me stand stock still, and want to get away. Seems to be having the same effect on chicken eaters. We built compost bins from simple things. T posts and pallets, coveredby a tarp. The tarp is there to prevent weed and grass seeds from blowing into it. 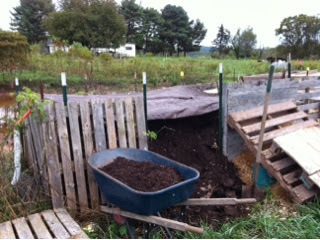 Sections are separated by pallets, and the compost in each section is a different age. Homer is pulling this out for planting spinach in the hoop house. It rained like crazy for a few days. A couple of open containers filled up with almost a foot of water in that short time. While we don't have a waterway on the farm, we have low spots. 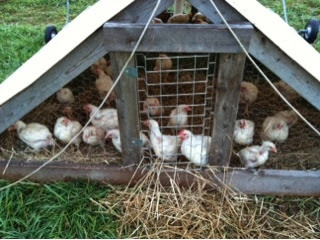 Most do not fill in with water, but under the chicken pens it can get quite nasty. A couple of bales of hay, spread under the birds in flecks, keeps them much more comfortable. And cuts down dramatically on losses. Simple solutions. We've heard it called "farm engineering", the ability to keep business running while not spending money on fancy solutions to simple problems. It's the only way we make it!